Fire blight is an important disease affecting pear and apple. Nationally, annual losses to fire blight and the costs of control are estimated at over $100 million (Norelli et al., 2003). While fire blight rarely kills an entire orchard in the western states, the disease and its control still cause significant economic losses. In the Pacific Northwest and northern California, there have been minor outbreaks annually since 1991 with at least some production districts experiencing major outbreaks every 3 to 4 years. Even minor disease outbreaks can be significant. For example, a 10% incidence of rootstock blight in a 4-year old apple orchard can result in losses up to $3,500 per acre (Norelli et al., 2003). 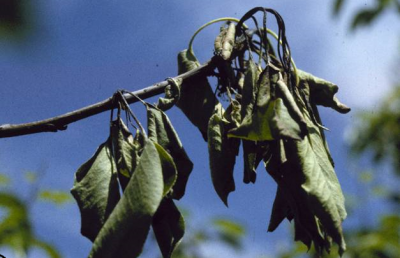 The fire blight pathogen, Erwinia amylovora, is native to North America. In the western United States, most common infections ordinarily occur on secondary blooms in May or June during the weeks following petal fall. Occasionally, however, the damage is done during primary bloom. Fire blight has always been a serious disease of pear, and the susceptibility of this species to fire blight is one of the reasons that United States pear production is concentrated in semi-arid regions of western states where dry summers lessen the impact of the disease. In apples, the danger of serious economic damage by fire blight has increased due to the adoption of high density orchard systems and widespread cultivation of susceptible scions on highly susceptible rootstocks. Funding for this article was provided by a USDA NIFA OREI grant for the project Implementation of Non-Antibiotic Programs for Fire Blight Control in Organic Apple and Pear in the Western United States. Fire blight is caused by Erwinia amylovora, a gram-negative, rod-shaped bacterium. It has appendages called flagella that allow it to swim in water. The bacterium grows by splitting its cells, and the rate of division is regulated by temperature. Cell division is minimal below 10°C (50°F), and relatively slow at air temperatures between 10°C and 20°C (50°F to 70°F). Above 20° C, the rate of cell division increases rapidly and is fastest at 27°C (80°F). Above 27°C, cell division slows and above 35°C (95°F), cell density on and in the plant can actually decline (Pusey and Curry, 2004). Colonies of pathogen cells on the host plant experience a wide range of temperatures each day, so the actual rate of colony growth varies from one moment to the next. Areas of branch tissue diseased with fire blight are termed cankers. Generally, older cankers appear brown to black and dry. On older branches, the bark within the canker may be sunken. Cutting away the bark from the edge of an active canker reveals reddish flecking in the cambium and outer xylem adjacent to the canker margin. This flecking represents young infections expanding into the healthy tissues. As the canker expands, the diseased cambium dies, turns brown, and dries out (Teviotdale, 2011). Figure 1. Overwintering fire blight canker in pear. Photo credit: Tianna DuPont, Washington State University Extension. Flowers are frequently the first part of the plant infected by Erwinia amylovora. Generally, symptoms are first visible about two weeks after petal fall. Initially, the floral receptacle, ovary, and peduncles become water-soaked and dull grayish-green in appearance. Later, these tissues shrivel and turn brown to black. Similar symptoms often develop in the base of the blossom cluster and in young fruitlets as the infection spreads internally. During periods of high humidity, small droplets of bacterial ooze form infected tissue. Ooze droplets are initially creamy white, becoming amber- to red-tinted as they age (Johnson, 2000). The characteristic “strike” symptoms that develop after floral infections may require up to 21 days to become noticeable. During this period of symptom development, the bacteria can move down and up the branch in xylem and phloem parenchyma cells, well ahead of the visible symptoms. Figure 2. Blossom symptoms 17 days after infection. Photo credit: Tianna DuPont, Washington State University Extension. The pathogen moves within the tree from flower infections to susceptible tissues such as nearby shoot tips. Succulent shoot tips may also be infected directly during hail storms or heavy rain. Diseased shoots wilt to form a symptom called shepherd's crook. Leaves on diseased shoots often blacken along the midrib and veins before becoming fully necrotic (blackened), and cling firmly to the host after death—a key diagnostic feature. Infections usually first appear on the 2-3 youngest, most tender non-expanded leaves near the shoot apex. These infections frequently progress down the limb, sometimes very quickly. Numerous diseased shoots give a tree a burnt, blighted appearance, hence the disease name. Figure 3. Shepherd's crook symptom on shoot tips. Photo credit: Ken Johnson, Oregon State University. Figure 4. Orchard with burnt appearance due to severe fire blight. Photo credit: Tim Smith, Washington State University Extension. 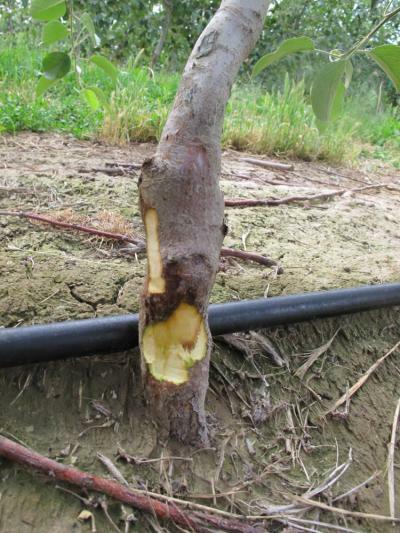 Rootstock infections develop at the graft union as a result of internal movement of the pathogen through the tree from flower infections or, less commonly, from infections through water sprouts or burr knots. Bark of infected rootstocks may show water-soaking, a purplish to black discoloration, cracking, and signs of bacterial ooze. Red-brown to black streaking may be apparent in wood just under the bark. The timing of rootstock symptoms is typically mid- to late-season, but sometimes they develop in the spring of the following season. Symptoms of rootstock blight can be confused with Phytophthora collar rot. ELMA.26 and M.9 rootstock cultivars are highly susceptible to fire blight (Johnson, 2000). Figure 5. Infection at graft union termed rootstock blight. Photo credit: Tim Smith, Washington State University Extension. Figure 6. Water-soaking and bacterial ooze as a result of fire blight in rootstock. Photo credit: Tianna DuPont, Washington State University Extension. Figure 7. Red-brown streaking under the bark of diseased rootstock tissue. Photo credit: Tianna DuPont, Washington State University Extension. Erwinia amylovora overwinters in cankers from the previous season. Pathogen cells survive primarily in canker margins where diseased bark tissue meets healthy tissue. In many of these cankers, the pathogen dies out over the winter, but in 20–50% of cankers, active cells of the pathogen survive until the next bloom period (van der Zwet and Beer, 1991). In spring, during periods of high humidity, the pathogen oozes out of the canker margins. A tiny droplet of this ooze (4 microliters) may contain 100 million to one billion cells (Slack et al., 2017)! Insects such as flies are attracted to this ooze as a food source (Ogawa and English, 1991), contributing to its spread. Figure 8. 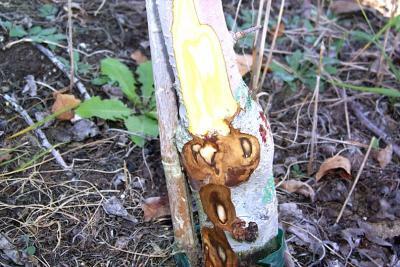 Pathogen ooze from old cankers is attractive to insects, which vector the pathogen from old canker to flowers. Photo credit: Tim Smith, Washington State University Extension. Insects or windblown rain are the primary means by which the pathogen moves from old cankers to flowers. When insects visit oozing cankers and then feed on nectar in nearby flowers, they transfer the fire blight pathogen onto floral surfaces including the stigmas, which are nutrient-rich surfaces located at the top of the styles. In warm weather, pathogen cells reproduce rapidly on stigmas. Once a few blossoms are infested, honeybees, other insects, and rain can move the pathogen to additional flowers (Johnson et al., 1993; Pattemore et al., 2014). This stage of the disease cycle is termed the floral epiphytic phase, where epiphytic means bacteria living and growing on plant surfaces prior to infection. Figure 9. Pathogen cells (1) multiply on the flower stigma (2) and if rain or dew occur are washed into the floral cup (3). Fire blight bacteria cells multiply on the stigma during the four to eight days the flower is open. If the weather is warm, the pathogen grows rapidly, forming a colony on the stigma. If the colony grows to greater than 100,000 cells, then the flower has a reasonable chance of being infected. In order for flowers to become infected, rain or dew must wash the pathogen cells from the floral stigma down the style into the floral nectary. The pathogen enters (infects) the flower near the base of the style by swimming through the small openings from which nectar is secreted. The infection begins in the developing fruitlet, and subsequently spreads down the petiole (stem) of the flower and into the cylinder of living cells (xylem and phloem parenchyma cells) located just between the bark and the wood of the tree, killing host tissues as it progresses (Momol et al., 1998). Figure 10. Pollinating insects including bees move the pathogen from flower to flower. Photo credit: Tianna DuPont, Washington State University Extension. Shoot blight infections generally occur later in the season, often during summer storms. Insects or windblown rain move pathogen cells from oozing cankers on trees within the orchard or from a neighboring orchard. Damage to young growth from hail, wind, or insects creates openings where bacteria can invade the plant (Biggs et al., 2008). Pathogen cells dispersed away from oozing cankers are viable for only a day or two and do not multiply again unless introduced to young tissues wounded by insects, wind, or hail. Occasionally, shoot infections also develop via internal movement of the pathogen through the xylem from a floral infection to the tip of a growing shoot. Secondary (rat tail) bloom refers to flowers that develop and open after the primary bloom. They are most abundant one to three weeks after full bloom, and are at high risk of developing fire blight. Late blooms are at high risk of infection because warm late-spring air temperatures are more conducive for bacterial growth and infection of flowers, and because the fire blight pressure in the orchard is higher. The intensity of secondary bloom varies from year to year and is difficult to manage horticulturally. Dwarfing rootstocks, in contrast to non-dwarfing rootstocks, tend to promote secondary flowering. Moreover, several widely-grown scion cultivars (e.g., Bartlett pear and Cripps Pink apple) can produce abundant secondary flowers. The younger the tree, the more damage that is likely to occur if it becomes diseased with fire blight. Cankers progress rapidly through young tissues and consequently, young trees. Once a branch is three to five years old, the rate of canker expansion slows. Young apple trees are also prone to the development of rootstock blight if the rootstock cultivar is highly susceptible to fire blight (e.g., M.9, EMLA 26) (Aldwinckle, 1998). Without causing symptoms, pathogen cells originating in cankers in upper limbs can move internally through the cambium and xylem to the graft union. If these dispersed cells are successful in re-initiating disease development at the graft union, rootstock blight occurs and kills the tree. Rootstock blight is most common up through the fifth leaf, and sometimes as late as the seventh leaf. After that, the frequency of this phase of the disease declines. If the rootstock is no more susceptible than the scion variety (M.7, seedling), then rootstock blight symptoms are rare. An exception is Bud9 rootstock. In Bud9, fire blight generally does not develop at the graft union. However, Bud9 rootstock is susceptible when inoculated directly. This is a concern due to its prolific root suckering. All ‘Geneva’ series rootstocks in commercial propagation, including those with dwarfing characters similar to M.9, are resistant to fire blight. Resistance in the rootstock is not transferred to the scion, however, and thus an infected scion cultivar on a Geneva rootstock can still be badly damaged by fire blight. However, damaged scions on resistant rootstock are much more likely to survive and regrow than die from a girdling rootstock infection. Rootstock blight is not a serious concern in pear. Cultivar susceptibility to fire blight has a genetic component, but susceptibility is also linked to the flowering habit of the cultivar. However, there are no commercial cultivars of pear or apple that are immune to infection. Cultivars that bloom relatively early, or for short periods then quit for the season, frequently escape infection. Cultivars that bloom late, straggle out the primary bloom, or produce secondary (rat tail) flowers during late spring are infected more frequently (Ostenson and Granatstein, 2013). Figure 11. Late ‘rat tail’ blooms after primary blooms have formed fruitlets. Photo credit: Tim Smith, Washington State University Extension. Tree vigor is influenced by age, nutritional status, and crop load. For example, a young tree pruned heavily and supplied with lots of nitrogen to encourage vegetative growth is more likely to suffer extensive damage when diseased with fire blight than an older tree that is being managed to produce fruit. 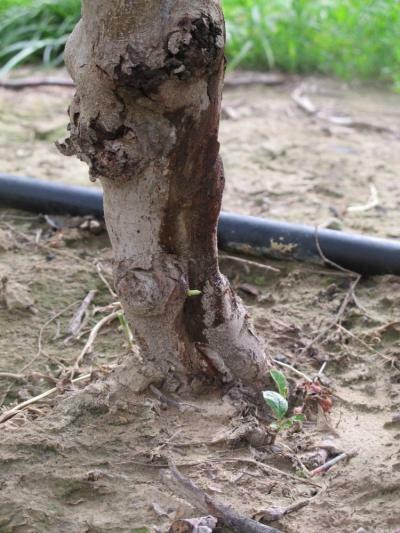 The common practice of pushing young trees with nitrogen fertilizer to “fill their space,” coupled with susceptible genetics, raises the risk for severe damage if fire blight occurs. It is important to note that moderating vigor will not prevent infection, but it will reduce damage done to the tree by expanding fire blight cankers. A serious fire blight outbreak requires a nearby overwintering source of the pathogen, but this source does not have to be large and can be located in a neighboring orchard. For example, a single active, overwintering canker can produce enough pathogen cells to infest a one-acre area during primary bloom, even if the daily temperatures that promote pathogen growth on the flower stigmas are relatively cool (Thomson, 2000). Proximity to an overwintering canker increases the risk that new flowers will be infested with the pathogen and become diseased with fire blight. Incidence of the disease in the prior year is an important factor in assessing the risk of fire blight in the current year. During the summer, fire blight from current-season infections largely drives the risk of shoot infection and infections that occur as a result of storm damage. Sanitation is an important aspect of fire blight management. Remove old cankers before the tree is shaped for structure in order to dispose of diseased prunings outside the orchard, eliminating them as an infection source in spring. Compared to pruning cuts made in summer, cuts in winter can be made closer to the visible canker edge because the pathogen is confined to the cankered area. Make the cut at the next horticulturally sensible site below the canker. Tools do not need to be sterilized when cutting on fully dormant trees. Some growers have effectively used blow torches (MAPP gas) to heat sterilize old cankers that were difficult to remove from the tree. When using a torch, the goal is to heat the cambium sufficiently to kill the bacterial cells. This temperature is approximately 140°F; i.e., when the tissue becomes too hot to touch. It is not necessary to completely blacken (char) the canker. Late (delayed) dormant applications of fixed copper bactericides also provide a partial degree of orchard sanitation. The timing of a delayed dormant treatment is typically 2–4 weeks before bloom. The copper residue on the tree kills viable pathogen cells as they are released from old cankers, which slows the rate of buildup of the pathogen populations in flowers during bloom (Elkins et al., 2015). During the spring and summer, it is advised to prune out fire blight infections as soon as they are observed, especially in younger trees. The observation of an active canker should also prompt inspections of other trees in the orchard. Pruning cuts to remove cankers in spring and summer should be made at 12–24 inches below the edge of the visible canker, with the longer distances used in younger trees with susceptible genetics. Removing a strike greatly reduces further damage to the tree, especially if the infection is removed at an early stage of development. Heat drives the buildup of the pathogen population on flowers, and moisture triggers the infection event. Frequently, when a period of high temperature without rain occurs, new infections are limited to low areas (where dew is more likely to occur) in the orchard. These areas form dew earlier and for longer duration. As few as two hours of wetting by dew is sufficient to trigger infection if the temperatures preceding the wetting event were favorable for pathogen growth. Anything that increases the relative humidity in an orchard (irrigation, frost control, dense as opposed to open tree architecture, cover crops, weed growth, wind breaks) increases the risk of a fire blight outbreak. It is particularly important to limit sprinkler irrigation when flowers are open, which has been shown to be an important trigger of blight outbreaks. Several studies have shown that pear and apples trees are not impacted or stressed by reducing the frequency of irrigation during the bloom and post-bloom periods. A little soil drying is actually beneficial, assuming trees are then well-watered during the more stressful summer period. It is unlikely that the trees can be overly stressed during the few days of peak fire blight risk at full bloom to petal fall and warm temperatures. Keep the intervals between irrigation as long as possible, and let the soil surface dry. Most fire blight outbreaks begin from flower infections. 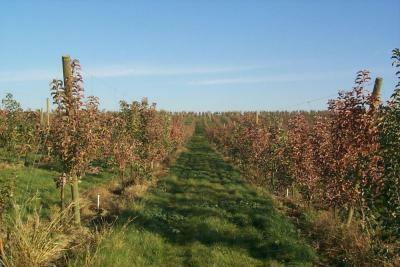 In a new orchard, the chance of infection is greatly reduced by removing blossoms (by hand or lime-sulfur thinning). Hand removal of flowers may take 2-3 hours per acre on first- or second-year trees. This expense needs to be weighed against spraying the orchard (perhaps multiple times) and the costs of labor and tree replacement if an outbreak occurs. 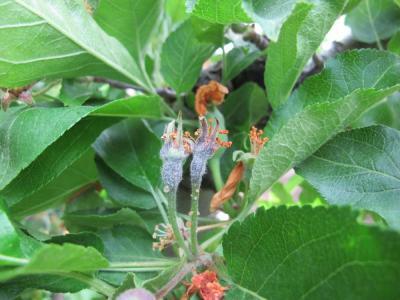 Many organic growers successfully use the blossom removal method to prevent fire blight from developing in secondary blooms on their young pears and apples. Fire blight outbreaks occur when open flowers experience summer-like weather. Daily high temperatures of 70–90°F promote rapid pathogen growth on floral stigmas, and flower-to-flower dispersal by insects. When warm days occur consecutively, the danger of infection increases. When temperatures are favorable for pathogen growth, their populations can double every 20–30 minutes. With sufficient numbers of pathogen cells (> 100,000 per flower), infections can occur within minutes. Moisture from rain or dew immediately after a warm period enhances the likelihood of infection. Weather-based risk models can predict potential fire blight infection risk. Examples include ‘Cougar Blight’ (widely used in Washington and Oregon), ‘Zoller’ (California), and ‘MaryBlyt’ (eastern U.S.). These models track heat unit accumulation above a critical temperature (60–65°F) over periods of several days to make an infection risk determination. Moisture events and the presence of fire blight in or near the orchard are also considered in the assignment of an infection risk category; e.g., low, moderate, high, extreme, and exceptional risk. Many growers and advisers find the weather models most useful for determining spray intervals (tightening or expanding) and planning when to spray, especially when used in conjunction with forecasts of temperature. After bloom, as the season progresses, air temperatures are nearly always conducive to pathogen growth and infection (Fig. 12), but fewer open flowers are present. During this period, it is important to continue monitoring weather forecasts for potential strong winds, rain, and hail events. Prior to and directly after storms is an important time to protect young trees and be prepared to monitor orchards and prune out new infections after storms occur. 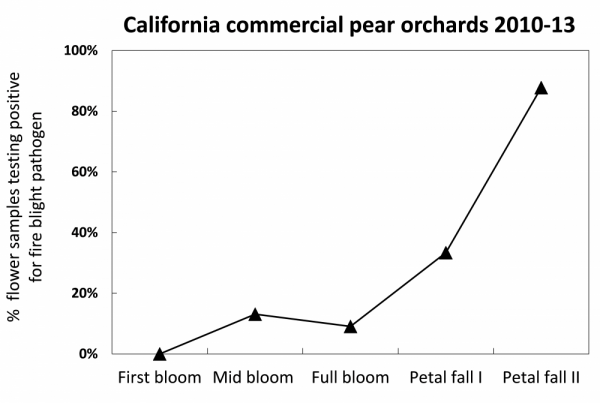 Figure 12: Fire blight populations in flowers tend to be higher near petal fall than early bloom because of the time it takes for pathogen reproduction and dispersal, and because of higher temperatures late in bloom. Pathogen inoculum availability makes rat tail flowers particularly prone to infection. Data in above chart from Elkins et al. (2015). Most pear cultivars and many of the consumer-popular apple cultivars are susceptible to fire blight, and consequently require a spray program to protect the trees in addition to cultural management described above. In general, spray programs for organic orchards are more intensive than contrasting programs for conventional orchards because organic growers are prohibited from using antibiotics to suppress infection. Integrated, non-antibiotic fire blight programs use the disease cycle to time the sequence of materials to target phases of pathogen activity during the season. A disease cycle depicts the life cycle of a pathogen and contains clues to management. We can use it to guide ways to interrupt the life cycle, and slow or stop the pathogen from proliferating in an orchard. The simplified fire blight disease cycle (Fig. 13) shows that the pathogen overwinters in old cankers. Then insects or wind/rain move the pathogen to the flowers where pathogen cells multiply and spread to the next flower at a rate determined by temperature. Oozing infections in flowers then provide inoculum for secondary infection of late bloom, shoots, and rootstocks. This disease cycle also shows approximate timings of non-antibiotic materials and how they can be integrated and sequenced to achieve effective disease suppression. Figure 13. The fire blight disease cycle showing timing for integrated control. Figure credit: Tianna DuPont. 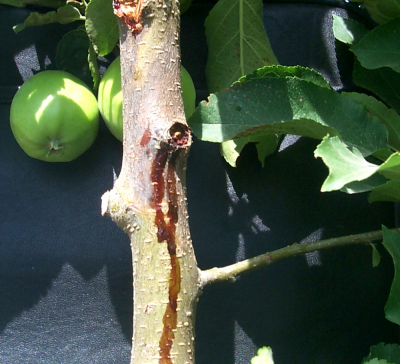 Delayed dormant (2–4 weeks before bloom): Application of a fixed-copper bactericide provides a partial degree of orchard sanitation by killing pathogen cells as they are released from overwintering cankers. This reduces the primary inoculum and delays the pathogen's colonization of the flowers. A delayed dormant application of a fixed copper is recommended only if fire blight was present in the previous orchard season. 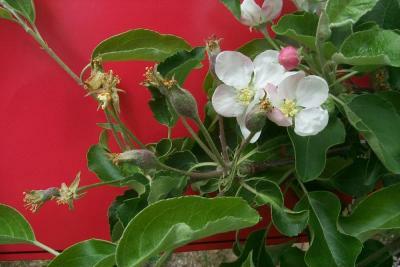 Early bloom: For apples in semi-arid production regions, lime sulfur is commonly sprayed in early bloom to thin flowers and manage fruit load. Lime sulfur used for thinning is also bactericidal and protects trees during the early bloom period. Biologicals such as Blossom Protect™ are also applied during early bloom. Blossom Protect™ is a living yeast that colonizes both the stigma and the nectary, competing with the fire blight pathogen for nutrients and space. In this competitive environment, the pathogen is less likely to attain a population size sufficient to cause infection. In general, the decision to use a biological material such as Blossom Protect™ is strategic and made independent of weather-based risk determinations. It should be applied after the last lime-sulfur thinning spray (a 1-day interval is sufficient). Full bloom to petal fall: In the latter half of bloom, Bacillus-based biorationals (e.g. Serenade® Opti) and soluble coppers (e.g., Cueva®, Previsto®) are used to protect the flowers from infection. They are best used during this period because they establish a protective residue on the surface of the nectary. In contrast, during early bloom when stigmas need to be protected, these materials do not penetrate sufficiently into the nutrient-filled cavities of the stigmas to suppress pathogen buildup on this tissue. Disease risk models such as Cougar Blight are most useful during the full bloom to petal fall period to aid decisions on when and how often to spray. Generally, soluble copper materials show higher efficacy than Bacillus-based biorationals, but the soluble coppers pose a greater risk of causing fruit russeting, the severity of which is dependent on cultivar-sensitivity and the presence of moisture during or just after spraying. The above sequence of non-antibiotic materials (lime sulfur, then yeast, then non-antibiotic chemical) is termed integrated control. While a given material alone may not be sufficient to manage fire blight in the orchard, a combination of materials at the right timings can provide control similar to or better than antibiotics. Read the label to be sure that the product is labeled for the crop and pest you intend to control, and make sure it is legal to use in the state, county, or other location where it will be applied. Read and understand the safety precautions and application restrictions. Figure 14. Examples of integrated control programs. Blossom Protect™ followed by non-antibiotic chemical materials provided a high level of control. Why Is It Important to Follow an Integrated Program? In conventional systems, antibiotic-based fire blight management can rely more heavily on weather-based risk models to determine the need for sprays. In organic programs, where biological materials are important components, spray applications based only on the model warnings will likely be too late to achieve effective control. In order to be competitive, biologicals need to grow their populations on the flowers before fire blight pathogen cells arrive in order to be competitive. This may take two to four days. Additionally, by integrating multiple preventative materials we are able to target the pathogen at each stage of its life cycle and gain overall better control. How Does an Integrated Program Vary Among Western States? Lime sulfur for crop load thinning has become common practice in semi-arid regions of central Washington. Its use, however, is less common in other states and is not used in pears. Although growers at higher elevations (Idaho, Utah) do chemically thin flowers and some use lime sulfur, some have been concerned about frost events after bloom begins, and are therefore reluctant to chemically burn off the flowers that open later in bloom. In more humid regions, the degree of burn that results from a lime sulfur application is less predictable (more variable), and thus it has received less adoption in these areas. The length of the bloom period varies from region to region, with fire blight being more difficult to control when the bloom period is long. In California, for example, because the trees receive fewer chilling hours in winter than trees grown farther north, the bloom tends to be longer with a straggly and untidy ending to the period of open flowers. Long bloom periods are especially prone to infection because the fire blight pathogen can build to very high populations when given this additional time. Areas with higher humidity, such as the primary pear-growing areas of Oregon, have a higher likelihood of fruit russetting than drier regions of central Washington. Consequently, soluble coppers should be applied when conditions promote drying of the material. Moreover, at least in one case, the yeast material, Blossom Protect™, has also been implicated as a cause of fruit russetting in a high humidity environment. As a general rule, russet risk is higher in smooth skin pears than in apples. And, in higher humidity areas, more reliance needs to be placed on fruit-safe materials. Bloomtime® Biological is a fruit-safe biological that can be substituted for Blossom Protect™ during the early bloom period. It affects pathogen growth on the stigma, but does not interrupt the infection in the nectary. In the latter half of bloom, Bacillus-based biopesticides (i.e. Serenade® Opti) are considered russet safe alternatives to soluble coppers. A drawback of Bacillus-based biopesticides is that the effective residual (days of protection after application) is only 2–4 days compared to 4–6 days for soluble coppers. Apply to every row. Research has found better colonization of flowers by A. pullulans when it has been spray-applied to the whole tree. Yeasts that colonize pome flowers do not appear to spread flower-to-flower as well as bacteria. Apply early. Applications during early bloom (30–70%) allow sufficient time for the yeast population to grow, which leads to more effective control. Use buffer. Applications with the companion material, Buffer Protect™, have shown significantly better control than with Blossom Protect™ alone. Reapply after lime-sulfur. Lime sulfur applications are both anti-bacterial and anti-yeast and will affect the populations of an applied biological. Reapply after lime sulfur treatment, or wait to use Blossom Protect™ until after lime sulfur. Delayed Dormant (just prior to green tip): Fixed copper sanitation if fire blight was in orchard last year (4–6 lb/A). Early bloom apple (crop load thinning): Lime sulfur during early bloom applied for crop load thinning is a strong anti-microbial. The lime sulfur percentage (2-10%) is based on the specific crop thinning goal. Reapply biological if lime sulfur goes on after the biological. Early bloom pear and apple: Blossom Protect™: One full application (every row) at maximum label rate, or if blight was in orchard last year, two full applications. In apple, apply Blossom Protect™ immediately after the second lime sulfur thinning spray. In smooth-skinned pears in wetter areas, russet risk from Blossom Protect™ might be unacceptably high. Bloomtime® Biological is an alternative, fruit-safe biological material. Note: biologicals, unlike antibiotics, should be applied preventatively. They need time to build their populations on the flowers. Waiting for the model to predict a high risk of infection is likely too late. Or for improved control, mix Serenade® Opti with Cueva® (2–3 qt/A), or use Cueva® (3–4 qt/A) or Previsto® (3–4 qt/A) every 4–6 days. (The latter option is least fruit-safe for russet). Rates on the higher end of labeled rates have been most successful in field trials. A drawback of non-antibiotic materials for fire blight control is that slow drying conditions after treatment can increase the risk of fruit russetting, which is a superficial damage to the skin of the developing fruit. This damage can reduce marketable grade of mature fruit. The period of highest russeting sensitivity is during the month following petal fall when fruit size is expanding rapidly (and thus fruit cuticles are very thin). Notably, soluble coppers and the yeast material, Blossom Protect™, have increased russet severity in some situations. Generally, a russet-tolerant apple cultivar grown in an arid environment is less prone to russet injury than a sensitive pear in a wet climate (Johnson, 2016). 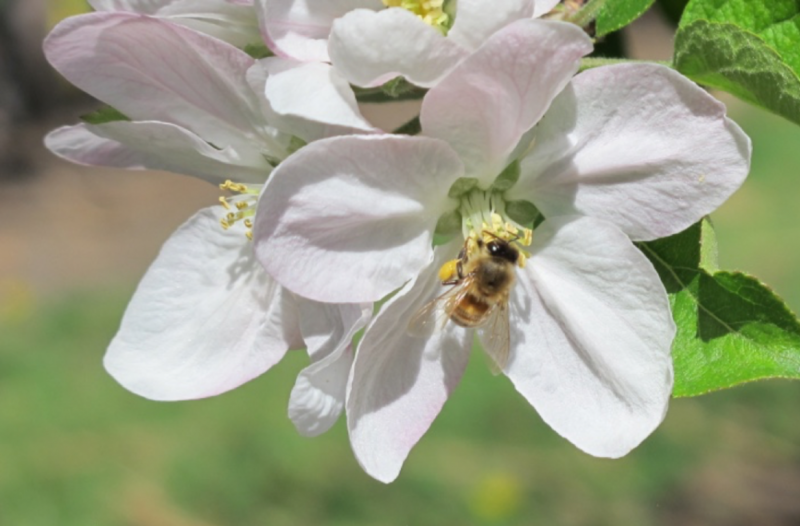 In most of central Washington, for example, the arid climate greatly reduces the risk of fruit russeting, and consequently Blossom Protect™ has shown a negligible russet risk in this area. Soluble coppers (i.e. Cueva® and Previsto®) carry a somewhat higher russet risk. A key to using these materials during periods of high russet sensitivity is to make spray application under weather conditions that promote rapid drying of the materials on the tree. Smooth-skinned pears are much easier to russet than apples. Pear cultivars range in sensitivity to russet from Comice and d'Anjou (very sensitive) to Bartlett (moderately sensitive) to Gem (resistant). Sensitive apple varieties include Golden Delicious, Opal, Fuji, and Jonathan. Figure 15. Russet Risk of Possible Fire Blight Materials. In the last few decades, numerous non-antibiotic products have been developed, registered with the EPA, NOP-approved, and marketed to orchardists for fire blight control (Table 2). The chart below shows materials that have received considerable research evaluation, and generally provided consistent and positive fire blight suppression. Biologicals are preparations of living microorganisms (gram negative bacteria and yeasts) that produce colonies on the stigmas and nectary surfaces when applied to open flowers. These microorganisms are most appropriate during early bloom to slow the pathogen buildup during the epiphytic phase. Insects continue to move them to flowers that were not open at the time of treatment. Copper materials vary in the form and amount of metallic copper (the active ingredient). Fixed-copper products have a longer residual time and are generally used for delayed dormant (green tip) and summer shoot blight protection in young, non-bearing orchards. In fixed coppers, most of the copper is insoluble with copper ions released slowly over time. Application of low-pH materials (e.g., Buffer Protect™) to trees treated recently with a fixed copper can cause a large release of copper ions and increase the potential for phytotoxicity (Rosenberger, 2011). Soluble coppers. Newer copper formulations are designed to reduce copper phytotoxicity and fruit russeting potential by introducing far fewer copper ions to the plant surface and adding safeners that also reduce injury potential. Examples are Cueva® (copper octanoate)—a salt of copper and a fatty acid (copper soap)—and Previsto®—copper ions in a matrix with alginate (polymer from seaweed) designed to reduce risk of injury to developing fruitlets. Both Cueva® and Previsto® have shown little phytotoxicity in semi-arid Washington trials, but have shown some risk of russeting in wetter areas of Oregon and California. Cueva® is compatible in tank-mixes with Bacillus-based biopesticides, while Previsto® is not, due to its high pH. Biorational is a term applied to Bacillus-based biopesticides, of which Serenade® Opti has the longest track record. Biorationals are considered to be non-russeting, fruit-safe materials. These biopesticides are made by fermenting strains of Bacillus spp. The activity against fire blight bacteria comes mostly from anti-microbial molecules produced by these bacteria during fermentation, in contrast to biologicals such as Bloomtime® Biological or Blossom Protect™, which colonize the flowers. Most of these products have both anti-bacterial and anti-fungal activity. Aldwinckle, H. S. 1998. Internal movement of Erwinia amylovora through symptomless apple scion tissues into the rootstock. Plant Disease 82:646-650. (Available online at: https://doi.org/10.1094/PDIS.1998.82.6.646">doi.org/10.1094/PDIS.1998.82.6.646) (verified 16 June 2017). Biggs, A. R., W. W. Turechek, and T. R. Gottwald. 2008. 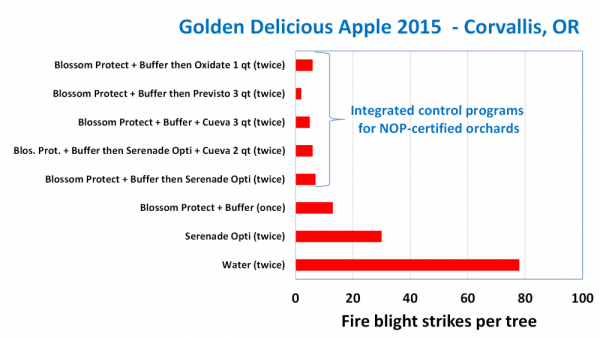 Analysis of fire blight shoot infection epidemics on apple. Plant Disease 92:1349-1356. (Available online at: http://apsjournals.apsnet.org/doi/pdf/10.1094/PDIS-92-9-1349) (verified 16 June 2017). Elkins, R. B., T. N. Temple, C. A. Shaffer, C. A. Ingels, S. B. Lindow, B. G. Zoller, and K. B. Johnson. 2015. Evaluation of dormant-stage inoculum sanitation as a component of a fire blight management program for fresh-market Bartlett Pear. Plant Disease 99:1147-1152. (Available online at: https://doi.org/10.1094/PDIS-10-14-1082-RE) (verified 16 June 2017). Johnson, Kenneth B., 2000. Fire blight of apple and pear [Online]. American Phytopathological Society, Plant Health Instructor. Available at: http://www.apsnet.org/edcenter/intropp/lessons/prokaryotes/Pages/FireBlight.aspx) (verified 16 June 2017). Johnson, K. B., V. O. Stockwell, D. M. Burgett, D. Sugar, and J. E. Loper. 1993. Dispersal of Erwinia amylovora and Pseudomonas fluorescens by honey bees from hives to apple and pear blossoms. Phytopathology 83:478-484. (Available online at:http://www.apsnet.org/publications/phytopathology/backissues/Documents/1993Articles/Phyto83n05_478.PDF) (verified 16 June 2017). Johnson, Kenneth B., and Todd N. Temple. 2013. Evaluation of strategies for fire blight control in organic pome fruit without antibiotics. Plant Disease 97:402-409. (Available online at: http://apsjournals.apsnet.org/doi/pdf/10.1094/PDIS-07-12-0638-RE) (verified 16 June 2017). Johnson, K. B., T. N. Temple, R. B. Elkins, and T. J. Smith. 2014. Strategy for non-antibiotic fire blight control in U.S.-grown organic pome fruit. In: Rezzonico, F., T.H.M. Smits, and E. Holliger (eds. ), Xiii International Workshop on Fire Blight. International Society for Horticultural Science, Leuven 1, pp. 93-100. (Available online at: http://www.actahort.org/books/1056/1056_12.htm) (verified 16 June 2017). Momol, M. T., J. L. Norelli, D. E. Piccioni, E. A. Momol, H. L. Gustafson, J. N. Cummins, and H. S. Aldwinckle. 1998. Internal movement of Erwinia amylovora through symptomless apple scion tissues into the rootstock. Plant Disease 82:646-650. (Available online at:https://doi.org/10.1094/PDIS.1998.82.6.646) (verified 16 June 2017). Norelli, John L., Alan L. Jones, and Herb S. Aldwinckle. 2003. Fire blight management in the twenty-first century: Using new technologies that enhance host resistance in apple. Plant Disease 87:756-765. (Available online at: http://dx.doi.org/10.1094/PDIS.2003.87.7.756) (verified 16 June 2017). Ogawa, J., and H. English. 1991. Diseases of temperate zone tree fruit and nut crops. University of California Division of Agriculture and Natural Resources, Oakland, California. Ostenson, Harold, and David Granatstein. 2014. Critical issues report: Fire blight control program [Online]. The Organic Center. Available at: https://www.organic-center.org/critical-issue-report-fire-blight-control-program-in-organic-fruit/) (verified 16 June 2017). Pattemore, D. E., R. M. Goodwin, H. M. McBrydie, S. M. Hoyte, and J. L. Vanneste. 2014. Evidence of the role of honey bees (Apis mellifera) as vectors of the bacterial plant pathogen Pseudomonas syringae. Australasian Plant Pathology 43:571-575. (Available online at: https://doi.org/10.1007/s13313-014-0306-7) (verified 16 June 2017). Pusey, P. L., and E. A. Curry. 2004. Temperature and pomaceous flower age related to colonization by Erwinia amylovora and antagonists. Phytopathology 94:901-11. (Available online at: https://www.ncbi.nlm.nih.gov/pubmed/18943112) (verified 16 June 2017). Rosenberger, D. 2011. Spring copper sprays for fruit diseases. Scaffolds Fruit Journal, Cornell University, pp. 5-7. (Available online at: http://www.scaffolds.entomology.cornell.edu/2011/110328.pdf) (verified 16 June 2017). Slack, S. M., Q. Zeng, C. O. Outwater, and G. W. Sundin. 2017. Microbiological examination of Erwinia amylovora exopolysaccharide ooze. Phytopathology. In press. Teviotdale, B. L. 2011. Fire blight [Online]. UC Statewide Integrated Pest Management Program, University of California. (Available online at: http://ipm.ucanr.edu/PMG/PESTNOTES/pn7414.html) (verified 16 June 2017). Thomson, S. V. 2000. Epidemiology of fire blight. In: Vanneste, J. L. (ed.) Fire Blight: The Disease and Its Causative Agent, Erwinia amylovora. CAB International, London, pp. 9-36.
van der Zwet, T., S. W. Beer. 1991. Fire blight—Its nature, prevention and control: A practical guide to integrated disease management. U.S. Department of Agriculture, Agriculture Information Bulletin Number 631. (Available online at: https://naldc.nal.usda.gov/download/CAT93989704/PDF) (verified 16 June 2017).